My paternal Barker family research has reached back to the late 1700s, and to the village of Barkway, just a few miles east of Royston in Hertfordshire, England. It is here that my 5x Great Grandparents James Barker and Sophia Taylor were married at the village's St. Mary Magdelene Church on 12th October 1784, and go on to become parents at least seven times between 1784 and 1803, although it seems that one son - Nathaniel Barker may have failed to survive infancy in 1797, as a second son by the same name appears in the baptism register six years later in 1803. Whilst there's a fairly clear ancestral line from me through the Barker family to the mid-18th century, the Barker surname actually appears in Barkway as early as May 1595, when a Urias Barker is buried at the village's St. Mary Magdalene church. It's not known how (or whether) Urias is related, as there's not a clear path from my 6x Great Grandfather Thomas Barker, and along with the presence of Parker and Baker families, picking out the Barker register entries written in the feint elaborate handwriting, can easily get names muddled. 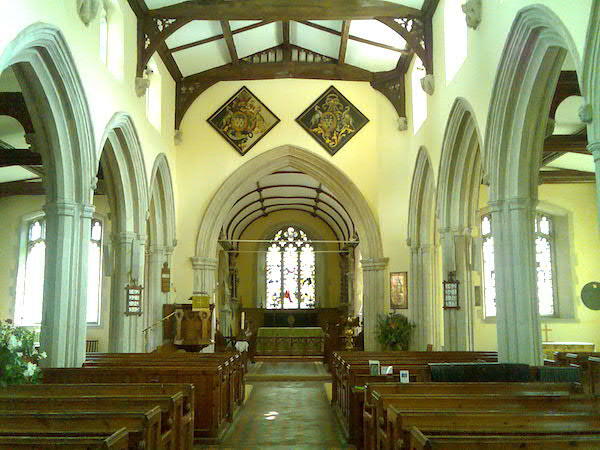 Above: The inside of Barkway's St. Mary Magdelene church would have been familiar to the Barker family. Photo: Andrew Martin. Whilst some of the Barker family remained in the village of Barkway, my 2x Great Grandmother Mary Ann Barker (the Great Granddaughter of Joseph and Sophia above) went off to find work. She turns up firstly in 1871 as a kitchen maid for a John H. Phillips in the town of Royston. He was JP for Hertfordshire and Deputy Lt for Cambridgeshire, and with a considerable farming estate. It's no surprise that Mary was amongst other staff members at his home including a nurse, butler, and a Lady's maid. This brush with a reputable household perhaps helped her get work in Abbey Road, London, where she appears in 1881. By 1891, she has married and become a mother, and is living in Dunstable, Bedfordshire with her publican husband (and my 2x Great Grandfather) George Burnell. After the premature death of George aged 41 in 1891 at their pub The Royal Oak in Dunstable, and pregnant with their final child, Mary bravely makes the decision to head to Littleport, where she and her daughters can take work in a clothing factory named Hope Brothers Ltd. The company had been advertising in newspapers for several years between 1886 and at least 1891 for "..respectable young girls for ironing shirts and collars." in exchange for "comfortable lodging", a reliable job and good wages. In doing so, she relocates again, bringing their young family to Cambridgeshire, and bringing them to live alongside her married older sister Louisa Barker, whose daughters also worked at the factory as laundresses. These sisters must have grown close, with Louisa acting as the informant of George's death, and now being able to help care for Mary and her family.